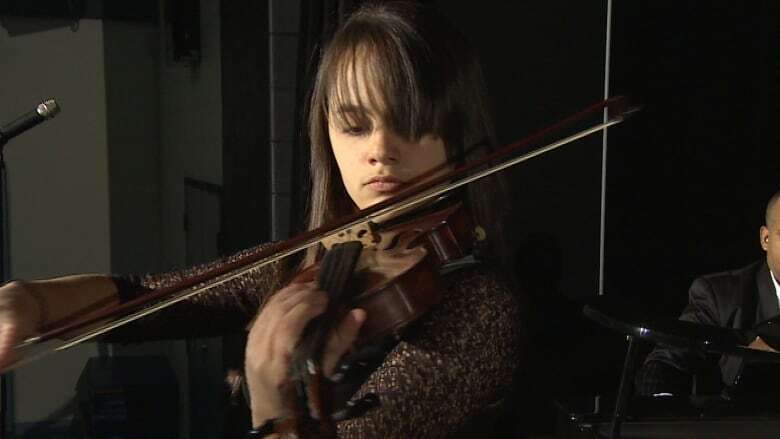 A 14-year-old Cuban violinist will soon call Nova Scotia home and she hopes the province's finest violin teachers can help her continue to grow as a musician. People are throwing around the word violin prodigy when it comes to Alison Enriquez. The young Cuban violinist will soon call Nova Scotia home and she hopes the province's finest violin teachers can help her continue to grow as a musician. Enriquez performed in the gym at Armbrae Academy in Halifax Thursday night at an event to help fundraise money for her education fund. She is part of the Los Primos project, an initiative started by Nova Scotian musician Jeff Goodspeed to connect Cuba and Nova Scotia through music. He has brought Cuban students here before on exchange trips, but this is different. "This will be the first time anybody (from the Los Primos project) has come here to study, it's going to be great ," said Goodspeed. While other teenagers are downloading the latest Justin Bieber tunes, Enriquez embraces classical composers, memorizing the pieces with her photographic memory note for note. "My mind goes to the history of the composer," she said. Just 14, Enriquez immerses herself in her music with daily practice and studying. She has only been playing for seven years and she knows there's a lot of work still to be done to keep improving — and she'll do that with help from her new Nova Scotian musical friends. "It's already exciting," she said. Enriquez will start at the private school in September and after school she'll head to Dalhousie University's music department where she will study with highly regarded professor Philippe Djokic. She's being mentored by Shimon Walt, a member of Symphony Nova Scotia, and she stayed at his place during Monday night's blizzard. "I had to tell her at midnight to stop practising and put the violin down," said Walt.